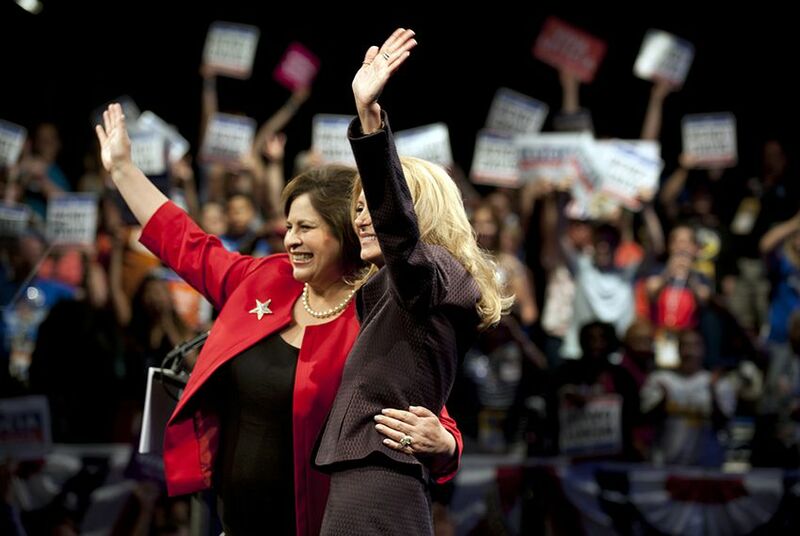 In speeches that combined homespun biography and harsh political attacks, Wendy Davis and Leticia Van de Putte accepted the Texas Democratic Party's nominations for governor and lieutenant governor. DALLAS — Wendy Davis and Leticia Van de Putte shared the spotlight at the Texas Democratic Party convention on Friday night, promising to change the direction of the state, ripping their Republican opponents and imploring Democrats to break the GOP’s two-decade grip on state government. Davis attacked her Republican opponent, matching his attacks at the GOP convention in Fort Worth earlier this month, and talked fighting insiders in Austin. “I’m running because there’s a moderate majority that’s being ignored — commonsense, practical, hardworking Texans whose voices are being drowned out by insiders in Greg Abbott’s party, and it needs to stop,” she said. Davis spoke about her background, her kids and her grandmother, all as a way of establishing her Texas roots and values. She talked about what she would do if elected, promising full-day pre-K “for every eligible child,” less testing in public schools, less state interference with teaching, more affordable and accessible college. She also implied she would end property tax exemptions for country clubs as part of property tax reform, and end a sales tax discount for big retailers who pay on time. She took some swipes at her opponent, too. Davis said Abbott accepts large contributions from payday lenders “and then clears the way for them to charge unlimited interest rates and fees.” She blasted him for taking contributions from law firms that handle bond deals approved by the office of the attorney general, and for saying state law does not require chemical companies to reveal what they are storing in Texas communities. “He isn’t working for you; he’s just another insider, working for insiders,” she said. When she ran for student council president in junior high, she said, she was told she could not run because she was a girl. “Well I did, and I won,” she said. She spent a large portion of her address criticizing Patrick’s Senate voting record — sometimes, she noted, he was voting alone — against investments in roads and water as well as in favor of more than $5 billion in cuts to public schools in 2011. She included a boisterously received dig at Patrick that referenced Texas Sen. Lloyd Bentsen’s famous put-down of Dan Quayle in their 1988 vice presidential debate. Davis and Van de Putte’s speeches were the climax of the first day of the Democratic state convention. Party leaders were hoping for a show of unity and enthusiasm. They were helped by a slate of speeches designed to fire up the convention center crowd. “Texans are ready for a change, and it’s a change Texas Democrats are ready to deliver,” he said. “Dallas County is a solid blue county,” state Sen. Royce West, D-Dallas, told the crowd to loud applause, surrounded by nearly a dozen of the county’s elected officials. And he went through a list of issues he said were evidence that elections matter. “You know that if Wendy Davis had been governor of the state of Texas, the voter ID bill would not have passed,” West said. Democrats, he said, would not have cut education spending in the 2011 legislative session had they been in control. He added that Davis would sign legislation — vetoed by Gov. Rick Perry — on equal pay for women. She said Democrats should be able to give three good reasons why they’re Democrats when they’re talking to voters. “We are a party of faith, we are a party of family and we are a party of freedom. We want to be able to live out our lives without unfair government interference,” she said. U.S. Rep. Joaquin Castro, D-San Antonio, told the delegates he wishes politics worked like professional basketball. “Why can’t we trade Ted Cruz to Massachusetts for Elizabeth Warren?” he asked. “I’ve met a lot of immigrants, and nobody ever told me they came to Texas for its low corporate tax rate,” Castro said. Castro said the Republicans are no longer the party of Abraham Lincoln, with the Emancipation Proclamation, or Ronald Reagan, with his immigration reforms that included amnesty, or even of Kay Bailey Hutchison, for whom Dallas’ convention center is named. “This is the party of Ted Cruz,” he said, getting a loud boo from a crowd that nearly filled the hall. State Sen. Kirk Watson, D-Austin, took a dig at Republicans’ leadership on public education, saying that Abbott’s response to school districts' suit challenging the current school finance system was to try to remove the presiding judge. “This isn’t as good as it gets,” he said repeatedly during his critique of the GOP’s direction of the state. Despite the rousing rhetoric on display Friday, Democrats head into the general election season at a crossroads. Davis and Van de Putte make for the party’s best-known set of statewide candidates in 12 years. The convention, as luck would have it, falls as the party faithful remembered the anniversary of Davis’ filibuster of an abortion restriction bill that made her a nationally known name. The women still trail their Republican rivals by double-digits in the most recent polling conducted by the University of Texas and The Texas Tribune. With the anniversary celebrations earlier in the week and the headliner speeches at the party’s convention, they now have a four-month opportunity to try to turn that around.